One by one, Lebanese designers are conquering catwalks across Europe. While many designers in Europe have faced problems due to the economic downturn, Lebanon’s fashion designers have had no shortage of work. They are thriving as the country profits from a year of political stability. Posted: January 4th, 2010 under Arts, Cultural, News. Not a single Lebanese have not seen, heard of, or tasted the three-sided pyramid juice Bonjus. This exquisite beverage has become part of the Lebanese culture, and will likely to stay for the many generations to come. But guess what, now not only you can drink it, but also you can wear it! Sarah’s Bag has added a new nostalgic item to its astonishing and fabulous collection of bags: the Bonjus bag. I have previously introduced Sarah’s Bag in my other post (Sarah’s Bag: Lebanon’s fashionable bags and accessories), but this post is dedicated specifically to this bag since I believe it is an impressive piece of work. 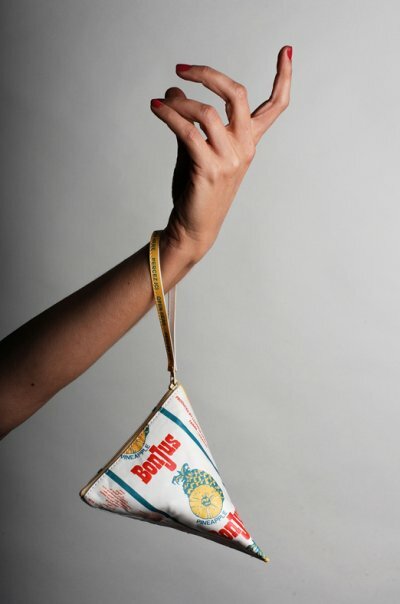 Who could have imagined that one day girls would be wearing a Bonjus bag?! In an article published by the daily L’Orient-Le Jour, Sarah’s Bag affirmed that its bag does not contain any liquid, is not explosible, does not come with a straw, but on the other side, it can last for a period more than just a childhood. If I were a girl, I would have definitely bought this bag. Posted: May 15th, 2009 under Arts. I first heard of this through Carla from Out of Lebanon blog, and thought that it would be interesting to introduce it to my entourage, even though I’m late on this and many of you must have already known about it. It is called Sarah’s Bag. It is distinctive, vivacious, and elegant with a touch of retro glamour and a street-wise sensibility. It is stylishly aware and socially responsible. Sarah’s Bag is a Lebanese line of handcrafted, custom-made women’s fashion accessories. It started out in the year 2000 as a collection of handbags, but soon after it has expanded to include beach totes, evening bags, clutches, and satchels, along with shoes, scarves, sashes, belts, bangles, and beaded necklaces. What makes them unique is that they are made by female prisoners and former inmates, and each piece requires 10 to 15 days of meticulous embroidering, beading, crocheting, and hand-stitching to produce. Sarah’s Bag is fast becoming a worldwide brand after many celebrities embraced its line of work, among them are French actress Catherine Deneuve and Queen Rania of Jordan. The story of Sarah’s Bag began when Sarah Beydoun, a Beirut-based Lebanese sociology student at the time, was writing her master’s thesis on female prostitution and women prisoners in Lebanon at the Université Saint Joseph (USJ). She realized she could combine her interest in improving underprivileged women’s lives with her love for fashion. Sarah decided to set up her company as part of a rehabilitation program, whereby women at risk from economic depravation or the stigma of having served time in prison would learn valuable skills in return for a reliable income and a stable source of pride, dignity, and empowerment. As the company expanded, Sarah teamed up with her friend Sarah Nahhouli. Sarah’s Bag showroom is located in the neighborhood of Gemmayzeh, a five-minute walk from Downtown Beirut. Other selling points could be found worldwide such as in the Gulf, Africa, and USA. Even though there isn’t any selling point yet in Montreal, I believe this will happen soon due to the company’s fast worldwide takeoff. For more information on Sarah’s Bag, its showroom and selling points addresses, collection, and press releases, you can visit its website at www.SarahsBag.com. For pictures of its line of bags, you can visit its Official Facebook Page. Posted: April 26th, 2009 under Arts.